The Braun Series 7 shavers are some of the most well-known and most sought-after electric shavers on the market. This comes to no surprise, as the Series 7 has offered great features and a great shaving experience for very competitive prices. Other electric shavers on the market either lack features or don’t offer the same great shaving experience that the Series 7 has at its price point. In this article, I’ll be running you through my Braun Series 7 reviews. As the differences are minor, I’ve tried to make the reviews short and to the point! It should be noted that there are quite a number of Braun Series 7s, and their naming system isn’t exactly that user-friendly (example: The 790cc vs the 799cc). I’ve also included a table for those who need a quick reference guide which they can refer to when they’re shopping for their very own Series 7 shaver. Based on shaving performance all the Braun Series 7 shavers are equal because all of them got the most advanced Sonic Technology. All those stuff will give you a personalization mode for an individual shave. You got to be aware of Braun’s marketing strategy. One additional simple feature sometimes makes a wide range of difference in the price. Our main goal here is to make you clear which one has the best feature with the best price as well. Do I Need To Upgrade Myself To The Braun Series 9? The Braun Series 7 comes jam-packed with plenty of features and technologies. You can see for yourself just how much Braun has packed into a single Series 7 unit to ensure that you have the best possible shaving experience. 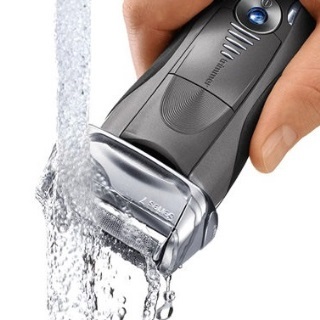 Each Series 7 shaver carries with it Braun’s Intelligent SyncroSonic technology. The cutting elements in the shavers vibrate at 10,000 vibrations per minute, allowing the shavers to cut even the smallest of hairs. The earlier models of the Series 7 had 3 shaving modes, while the latter ones have 5. Increasing the intensity of the shaving mode increases the movement of the blades inside the shaver. Later models introduce a turbo mode which cuts the fastest. The shaver is able to detect the density of the hair being cut and adjusts the power of the shaver accordingly. The shaver is capable of adjusting the power up to 13 times per second, which gives the shaver the perfect amount of power to cut your facial hair. Braun realized that one of the problems with shaving is those flat-lying hairs that just refuse to be caught by the foils in their shaver. To solve this, they created a cutting element between their two foils that lifts up and cuts flat-lying hairs. Braun’s OptiFoils is capable of capturing almost all of the facial hair when shaving. They are able to do this by creating an ergonomically designed mesh that contours to the skin of the user. Because of how many moving elements there are on the cutting elements of the shaver, Braun included the Protective SkinGuard to reduce the friction caused by these elements. This makes sure that your skin doesn’t get irritated by using the shaver. 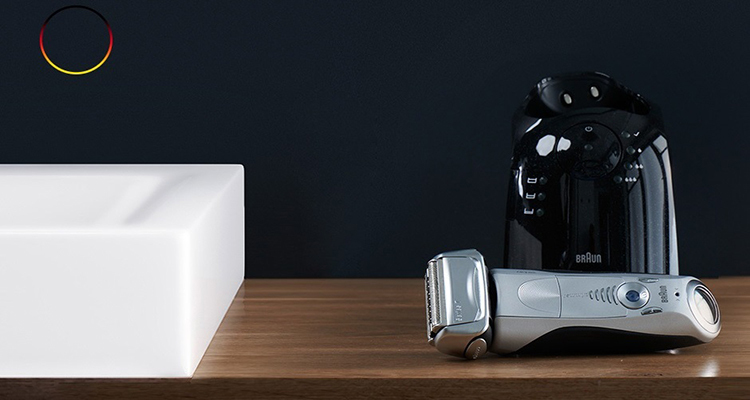 The head of the Series 7 shaving units is capable of moving in 8 different directions, which allows the shaver to cut to as close to the skin as possible. This is possible because of the MacroMotion and MicroMotion technologies Braun integrated into the shaver. The shaver perfectly follows the contour of the user, making the shaving experience as comfortable as possible. MacroMotion allows whole head to pivot an astonishing 40 degrees. This means that your hand users don’t have to hold the shaver at awkward angles just to reach those hard to reach areas. Micromotion lets all the cutting elements of the Series 7 automatically adjust to the unique shape of each person’s face. Ever since Braun introduced the Series 7 back in 2010, the 790cc has been one of the most recommended electric shavers out there. Having seven different minor revisions, the 790cc is still one of the benchmark shavers in which all other electric shavers are compared to. Braun has expanded the Series 7 into multiple other shavers, but all of them are derived from the 790cc. In the package, you’ll be able to find the shaver itself, the cleaning/charging unit, a cleaning cartridge, an electric cord and a travel case. The shaver has three cutting elements, two OptiFoils and one ActiveLift trimmer, which are designed to cut even the trickiest of facial hair. It carries with it an adaptive shaving motor that pulses 10,000 micro vibrations per minute. It has a flexible head that can move in 8 directions that allows you to reach hard to reach areas with precision. It has five different power settings, from sensitive to intense, which makes the shaver useable for men of different kinds of skin type. When combined, all of these elements ensure that you have a clean and smooth shave that’s able to capture and cut even the smallest of facial hair. Additionally, the unit is waterproof which makes it easy to clean with running water (though it is recommended that the unit is cleaned regularly using the included base). As for the cleaning unit, Braun created an all-in-one unit that not only cleans and disinfects the cutting elements of the shaver but also charges the shaver as well. For those on the go, the travel case fits the shaver and the electric cord perfectly. You can remove the electric cord from the cleaning unit and be able to charge the shaver directly. I’d like to commend Braun for creating one of the comfiest and ergonomic electric shavers out there. The sides of the shaver are lined with rubber, so you’re guaranteed that it won’t slip even when you’re fresh out of the shower. It is curved just enough to fit the contour of your hand without it being awkward to handle. And it carries a 50-minute battery so the shaver won’t die on you in the middle of a shaving session that requires utmost precision. As for the shaving experience itself, there’s a reason why this product is highly rated on Amazon: to put it simply, it is amazing. Everything Braun advertises about the 790cc is on the mark. The shaves are close and leave little to no irritation. Whereas other shavers might require additional strokes to get all the facial hair, the 790cc only needs one. There’s little to complain about the 790cc. Personally, I think Braun could have been a bit more generous with the included cleaning cartridge. Left unattended, the cartridge does evaporate quite fast as its alcohol based. A bit more of the liquid would have allowed it to last longer before needing a replacement. 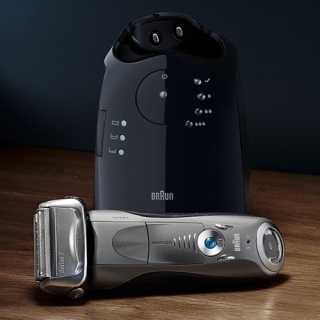 The 799c is the first in Braun’s Series 7 series to feature both wet and dry shaving. The package comes with the shaving unit, the charging/cleaning base, an electronic cord and three cleaning cartridges. It has three cutting elements, two Optifoils and one ActiveLift trimmer, to guarantee a clean and smooth shave every time it’s used. The 8 directional head allows maximum flexibility while using the shaver, allowing those hard-to-reach areas to be reached without difficulty. 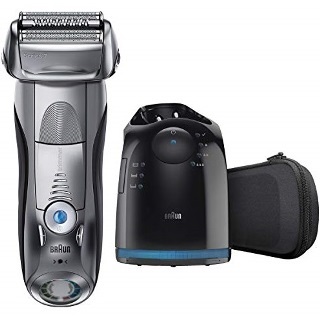 It has five different power modes, ranging from sensitive to intense so that men of different skin types and sensitivities can freely use this shaver. The motor produces 10,000 micro vibrations per minute which help the Optifoils and ActiveLift trimmer in capturing stray and weirdly-angled hairs. It has an LCD display that tells you the statue of the battery, as well as the health and sharpness of the cutting elements. The cleaning base is fully capable of charging the shaving unit, with the shaver being fully charged in 50 minutes. The base also removes cut stubble, sanitizes and deodorizes the shaver unit, keeping the shaver unit as hygienic as possible. It automatically cleans the unit depending on how long it’s been last cleaned by the base. It should be noted, however, that the 799cc cannot be charged without its cleaning base. The 799cc has one of the best shaving units out there due to its great ergonomics. The body is wrapped in rubber and has ridges which allow easy gripping of the body. These ridges also prevent accidental slippages while during use. The head mechanism follows the contour of your head, so you don’t have to put your arm in uncomfortable positions just to get shave that area under your chin or under your nose. As for its shaving capabilities, the 799cc never fails to deliver whether you’re using it for wet or dry shaving. The cutting elements (the two Optifoils and Activelift) do a great job in making sure that even the tiniest or oddly shaped hair are captured and cut. As stated, the 799cc can’t be charged without its charging base. For those who like to travel for long periods of time and like doing wet shaves, I cannot recommend the 799cc as the base is needed for it to regain its charge. While you can still carry the shaving unit alone if you’re only going out for a short trip, the packaging doesn’t include a carrying case so you’ll have to provide one of your own. The 760cc is Braun’s middle of the road entry to the Series 7 shavers. In the package, you’ll find the shaver unit, the cleaning base, a travelling pouch, a charging cable and a maintenance kit. The 760cc comes equipped with two of Braun’s signature OptiFoil and one SkinGuard. These cutting elements are capable of cutting to as close as .05mm of your skin. The eight directional head makes shaving easy and comfortable as it automatically adjusts to the shape of your face. The motor produces 10,000 micro-vibrations per minute, which assist in capturing even the smallest of facial hair. The unit has five different power settings, from Sensitive to Intensive, to fit every man’s skin type. Additionally, the body is fully waterproof and comes with a LED status indicator which should tell you the overall status of the shaving unit. The cleaning base is fully capable of charging the shaving unit, giving it a full charge in as fast as 50 minutes. Using an alcohol-based solution, the cleaning base is able to sanitize the shaving unit and remove stuck stubble. Braun’s renowned Series 7 shaving experience is still very much present in the 760cc. Although it has a few downgrades compared to the higher tier Series 7 shavers (having a LED indicator over an LCD one, non-automatic cleaning), it still delivers the same shaving experience that consumers have come to love. Its capable of both wet and dry shaving, so whichever form of shaving you prefer, the 760cc will be able to do that without any problem whatsoever. 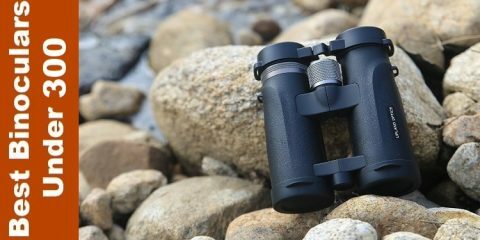 It has a highly ergonomic grip that can be gripped easily and doesn’t slip thanks to the intelligently placed ridges at the front and the back of the body. For the price that it’s asking, I hoped that Braun made the 760cc more distinct when compared to the other models. Most models can be bought at around the same price range nowadays, which weakens the case in buying the 760cc over higher tier Series 7 shavers. Braun recognizing that there needs to be an option for those on the go, created the 740s to cater to those people who are always travelling. Unlike most other Series 7 shavers, the 740s doesn’t come with a charging base. The package includes the shaver unit, a charging cable, cleaning oil for the razor and a travel pouch. The 740s comes packed with two Optifoils and one ActiveLift trimmer for the clean shaving experience people have come to expect from Braun. The 8 directional head easily adjust to the contours of your face, allowing those hard-to-reach areas to be much more accessible. The motor, which produces 10,000 micro vibrations, allows the 740s to capture even the smallest of hairs. The 740s comes with 3 power options: Sensitive, Normal, and Intensive, which should cover the majority of the skin types out there. The 740s is capable of both dry and wet shaving and is waterproof up to a depth of five meters. The LED indicator at the bottom of the unit tells you how much charge there is left, as well as the health and status of the cutting unit. For cleaning the unit, the 740s comes with a small maintenance kit, which includes a small brush and a tiny bottle of cleaning oil. If you’re not one to care for the features of the charging base that come with other units, then the 740s is perfect for you. Because the shaver itself is relatively the same one found in the previously mentioned three shaver packages, you would still be guaranteed with the fast and clean shaving experience the Series 7 is known for. While cleaning isn’t automated anymore, the 740s is fully waterproof so running the trimming elements underwater and occasionally cleaning it with the included oil and brush should be more than sufficient to keep your 740s operational. In my opinion, Braun should have included more cleaning oil in the packaging. While I do understand that the removal of the charging/cleaning base is done to reduce costs, cleaning the tiny holes of the 740s is a chore without the proper oil. An additional bottle or two of the included cleaning oils would have definitely made this product much more attractive. 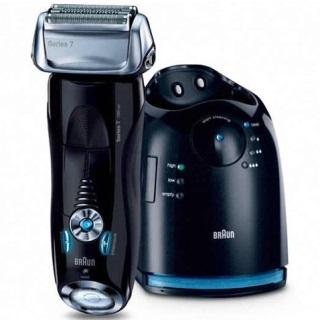 The 720s is the fundamental Series 7 shaver. Braun recognized that there is a small audience out there that don’t need some of the features of the Series 7 and only need the bare essentials that would give them a clean and crisp shave. Inside the packaging, you’ll find the shaver unit, a travelling pouch, a charging cable and a small maintenance kit. The 720s rocks the Series 7’s two Optifoil and one ActiveLift trimmer setup. The eight directional head, alongside the 10,000 micro vibration motor, ensures that all the facial hair is captured and cut with ease. The unit comes with three power settings: sensitive, normal, and intense. The shaver is capable of dry shaving only but is fully waterproof up to 5 meters. The LED indicator keeps track of the charge of the battery. The 720s is as barebones as it can be. If you don’t need any (and I mean any) other features other than a having a reliable dry shaver, then this is the Series 7 shaver for you. It keeps everything the higher tier models have for a much lower price point. If you just need what the Series 7 is known for (the cutting elements, the ergonomic grip), then look no further. If you’re curious if Braun lessened the shaving experience with the 720s, I can safely say that this isn’t the case. The 720s delivers the same great shaving experience consumers have come to expect from the Braun Series 7 shavers. I wish Braun differentiated the 720s much more. As it stands, for a few more dollars you can get yourself a higher tier Series 7 shaver. Those units have an additional rubber grip to the side, which really helps in gripping the shaver during shaving. The 7865cc is the updated unit to the Series 7 line. Released in 2016, Braun wanted to consolidate the various Series 7 models into fewer product lines. The 7865cc is a result of this. These two shavers come with the same double OptiFoil and single ActiveLift shaving elements consumers have come to expect from the Braun 7 Series line. The eight directional head is still intact, giving the greatest amount of flexibility to its users when it comes to shaving. The five different power settings, from sensitive to intense, covers almost all types of men’s skin type which can help tackle skin irritation which is caused by the movement of the cutting elements. The unit is capable of both wet and dry shaving. It is fully waterproof to a depth of 5 meters and has a display indicator at the bottom of the unit which shows the overall health and status of the unit. The base is an all-inclusive base that is capable of both charging and cleaning the shaving unit. It automatically detects how long it has been since the shaving unit was last cleaned, and cleanses it proportionally. It also removes the stubble collected by the shaving unit. As for charging, the base can fully charge the shaving unit in as fast as 50 minutes. This gives the unit enough battery to run for as long as 60 minutes. The 7865cc is one of the most flexible shavers out there. It’s capable of both wet and dry shaving and can be operated both with or without the charging and cleaning base. The small upgrades that Braun has included in the 7865cc, like the updated charging cable, are subtle yet increase the enjoyment in using the unit. 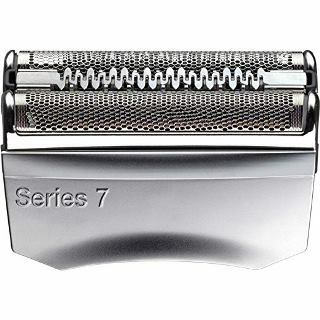 For the shaving experience, it still has that clean and comfy feeling that the Series 7 shavers never fail to deliver. Whether you’re a dry or wet shaving kind of person, the 7865cc is guaranteed to do an excellent job. One of the downgrades in the 7865cc is that the charging base has no active induction heating system. Older models included this and made the shaver dry in as fast as 30 minutes. Now, it takes up to 4 hours for the alcohol in the cleaning solution to fully evaporate. Although you can still buy older charging bases that have this function, it is an added expense that isn’t just worth it. The 7893s is Braun’s update to the baseless models of the Series 7. The packaging comes with the shaving unit, a carrying pouch, a charging unit and a small maintenance kit. The 7899s comes with two Optifoils and one ActiveLift cutter. These cutting elements guarantee a thorough shave, reducing the number of times you have to run the shave over your facial hair. The eight directional head has a great deal of flexibility, making those tricky areas much easier to reach. The motor, which produces 10,000 micro-vibrations per minute, assist the cutting elements in capturing those stray hairs that just refuse to be cut down. The unit is capable of both wet and dry shaving. It has a LED indicator which displays battery status. The 7893s is Braun’s new stand-alone shaver for the Series 7. This means that it doesn’t come with a cleaning base, which pushes the price up by quite a bit. 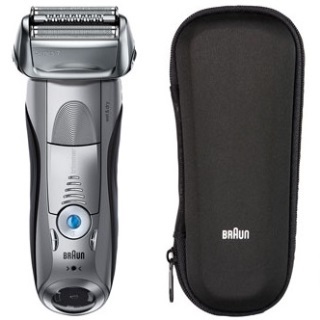 For those who just need something to do the job without fuss, then the 7893s is the Braun Series 7 shaver for you. The unit is weighty and its ergonomically designed grip means that it won’t slip away as long as it held properly. The shaving experience is excellent, causing very little to no irritation and the shaver is able to catch even the smallest of hairs. In short, the 7893s provides the expected Series 7 shaving experience. I wish Braun included a better maintenance kit with the 7893s. The included kit just barely does the job, and a bigger brush or more cleaning fluid would make the cleaning experience better. The Clean & Renew system revolves around the Clean&Charge station. Majority of the shavers here usually come with Braun’s high-tech Clean&Charge Station. The stations are smart, as it remembers how long it has been since the shaver was last cleaned. The longer you don’t put your shaver back into the station, the longer the cleaning process will be when you finally do. In most models, the Clean&Charge Station also comes with a Fast Clean option for those who need to use their shavers in a hurry. According to Braun themselves, with the Clean&Charge station, more than 150 people have confirmed a closer shave, and over 110 have stated that they have had better skin comfort with regular use of the Clean&Charge Station. The system has 4 distinct elements. First is Clean. The Clean&Charge station applies an alcohol-based solution to remove the stubble gathered from shaving. This also disinfects the cutting elements of the shaver, as well as cleans it from other gathered substances and debris. The second is Charges. While the shaver is undergoing the cleaning process, the shaver is also being charged. The long-cleaning process takes around 40 minutes to do so, and to fully charge the shaver takes 50 minutes. While these processes only happen when the shaver hasn’t been docked to the station in a long time, it shows that the cleaning and charging processes are tied to each other. The third is Lubricates. Besides being a cleaner, the alcohol-based solution is also a lubricant, ensuring that the shaver glides smoothly during use. It also adds a lemon scent to make your shaver smell fresh and clean. The fourth is Dries. After the cleaning process is complete, the shaver is heated using an inductive dryer. However, this feature is not available in the newer Series 7 stations but are available in all Series 9 stations. Series 7 shavers all come with a precision trimmer that pops-up underneath the shaver’s head. The trimmer is perfect for those quick touch-ups or for those who need to shave their beard or sideburns daily. Series 7 shavers are waterproof up to 5 meters, making them capable of being used under running water or even during showering. The display on the base of the Series 7 accurately tells the status of the Shaver. It indicated battery levels, charging status and even if you need to change the foil cartage. The Li-Ion battery allows Series 7 shavers to be used continuously for 50 minutes. It also has fast charging, fully filling up the battery in just 1 hour. For those in a rush, these shavers can be charged for 5 minutes which gives it enough charge for one shave. For those difficult areas, The Series 7s head can be locked in place to give maximum control for the user in those problematic areas like under the nose. The 799cc is a slightly upgraded version of 790cc. The 799cc comes with a luxury travel bag, an extra charge level indicator, and a hygiene level indicator . However, the 790cc can be used while charging with the cord while the 799 can’t. The 790cc has a more feature-packed cleaning and charging base. The 760cc’s charging base has no automatic cleaning and has no hygiene indicator. This means that 760cc users have to manually start the cleaning process and check the levels of the cleaning liquid. The 740s does not come with a charging dock. Instead, it comes with a travel pouch and a small maintenance kit. Another minor feature is that the 790cc comes with an LCD indicator, while the 740s comes with a very simple LED one. The 7865cc comes with a slightly different charging and cleaning base. Unlike the 790cc’s charging and cleaning base, the 7865cc does not have a heat induction system, which is a downgrade. There is no difference between these two others than colour. The 7865cc comes in Grey while the 7898cc comes in Silver. Both of these shavers have the exact same features. It is well known that dull or rusted blades can cause irritation. It also cuts and nicks more often, which can cause small wounds that could be infected. 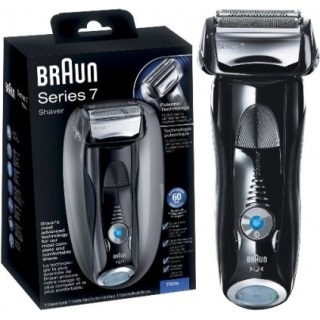 Braun suggests that you replace the Foil and Cutter (the cutting elements) of your Series 7 every 18 months to ensure that shaving is clean and comfortable. If your shaver comes with a cleaning and charging station, it will also indicate if the cutting elements need to be replaced soon. As for replacing the head itself, the process is quite easy. First, ensure that your shaver is completely turned off. Then, press the foil lock at the side of shaver’s head. This should unlock the cutting elements from the head. A gentle pull should detach the cutting elements from the rest of the body. Before putting in the new cutting elements, use a small brush to remove any stubble that may not have been removed by the cleaning base. After which, you can insert your new cutting element. Remember to reset the counter after by using a ball-point pen to press the small button underneath the Braun logo. In order to keep your Series 7 in top condition, as well as prolonging its lifespan, it is important to constantly maintain your shaving unit. Fortunately, the engineers at Braun have made this process really simple. For those with units that come with charging and cleaning bases, maintenance is relatively simple. Just by putting your shaving unit back into the base after shave will ensure that the unit is fully charged and that the cutting elements are properly lubricated and cleared of debris. The cleaning and charging base, however, needs the cleaning cartridge which has an alcohol-based solution (a pack of which should be included in your purchase of a Series 7 unit) in order to function. The cleaning cartridge, when shaving daily, should be able to last for up to 30 days. For those who shave less often, it is estimated that the solution will fully evaporate in approximately 8 weeks. Be aware that the cleaning process might leave some residue on the shaving unit. Don’t worry, as this is harmless and can be wiped away with some tissue paper. For those without the cleaning and charging base, or for those who prefer to clean it manually, there is also a procedure to follow. First, make sure that the shaver is detached from the charging cord. Then, turn on the shaver. While turned on, run it under hot running water in order to remove any stuck hair and partially disinfect it of any germs. You can add liquid soap while doing so to further sanitize the shaver. After which, turn off the shaver and apply a drop of oil to the foils and spread with your finger to keep the cutting elements lubricated. You’ll also want to remove any stuck stubble. Very much like replacing the cutting elements, simply press the button on the side of the head, remove the cutting elements, and then remove the insides of any stuck stubble using the small plastic brush included. From this, I can say that upgrading to the Series 9 is only worth it if you have very coarse or irregular facial hair. Additionally, you should also only upgrade if budget is not a big deal. I would recommend that you only get a Series 9 if and only if they’re on sale and the price is near or identical to a Series 7. Otherwise, just get a Series 7. It will probably have most features that you need, and the price premium to go from a Series 7 to a Series 9 just isn’t worth it. Read more: Braun Series 7 vs Series 9: Is It Worth Upgrading? Can a woman use this? If they can, where? Yes! Absolutely! While the Series 7 is marketed for men, the Series 7 can be used by women as well. They can use it on their face, legs, underarms, body and on pubic hair. Just make sure to observe proper shaving safety when doing so. Can I use this to shave my head hair? While the Series 7 isn’t designed to do so, some people have reported that they do use the Series 7 to shave and keep their head hair very short. Of course, I would still recommend that you let a barber do the shaving for you, as it’s possible for you to nick yourself while doing so. Is this suitable for all hair and skin types? The Braun Series 7 is suitable for all hair and skin types. It is designed so that whether you have thick or thin hair, straight or curly hair, rough or sensitive skin, fast or slow hair growth, the Series 7 can tackle it with ease and comfort. Can I use this abroad? Yes! Braun Series 7 shavers are dual voltage and can support 100-240v. Just make sure to carry a plug converter when travelling abroad to make sure you can plug it into the wall sockets of the country that you’re travelling to. Is it okay to leave the charging base/shaving unit plugged in? While it is safe to leave them plugged in unattended for a long time, you’ll probably want to plug it out if you’re not using them to charge or clean. How often should I clean the shaver? As often as possible. In the units with the included cleaning base, just putting back your Series 7 shaver in the base should ensure that your shaver is always clean. What’s the difference between wet and dry shaving? 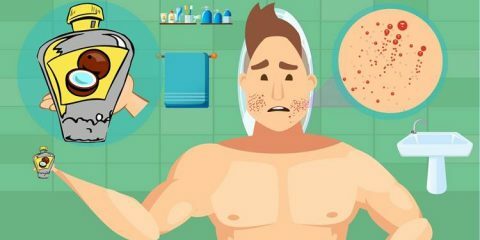 Dry shaving is directly shaving your facial hair without dampening the skin/hair first. Wet shaving is when the skin and hair are wet or moist, usually right after a shower or after washing up. There are certain advantages and disadvantages to either type of shaving. Which type (wet/dry shaving) does Braun recommend? 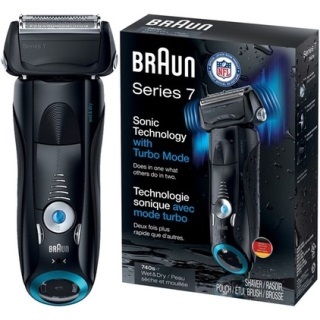 While the Series 7 is capable of both wet and dry shaving, Braun recommends that you use the Series 7 for dry shaving as opposed to wet shaving. Can I use shaving gels or creams while using the Series 7? You can, but it is not recommended. There’s a change that a thick application of shaving cream or gel might jam or damage the internal cutting units. If you really have to do so, you’ll probably need to buy specialized shaving creams which are designed to work with electric shavers. They are not. In order to make the Series 7 waterproof, Braun had to make sure that the shaving unit was fully sealed. This meant having the battery non-replaceable. If your battery is malfunctioning for some reason, it’s best to contact Braun’s customer service to see what your options are. Is there a beard trimmer included? While it does include a flip-up trimming unit designed for trimming sideburns, this can be used to trim the beard as well. However, this probably won’t be effective as getting a dedicated beard trimmer. I suggest only using the trimming unit for beards if you have no other option? After evaluating the most popular Series 7 (and even considering the Series 9 for a bit), my recommendation would definitely go to the Braun 790cc. For the price that it usually goes for, it’s a very value-packed shaver that has everything most men would need. 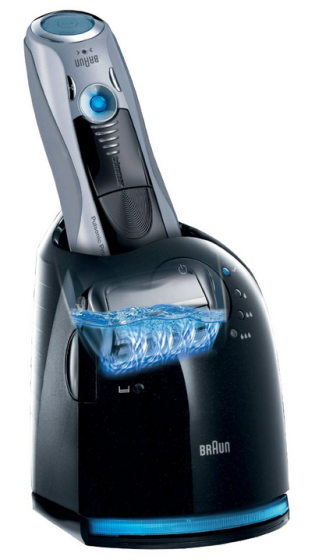 For those who want wet shaving, 790cc is a great choice as this shaver is capable of wet or dry shaving. 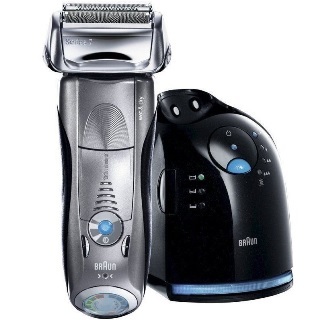 Additionally, Braun 790cc is the top selling shaver among all the Braun electric shavers. Do I have to say more? Be sure to look out for older models, especially those with cleaning and charging bases that still have the inductive heater. The newer models don’t have this feature in their charging and cleaning bases. My runner up is the 7865cc. Since the 790cc is hard to find nowadays, the 7865cc is a great alternative as it has the same features as the 790cc but can be found much easier. I hope this guide helped you in deciding which Series 7 shaver you should buy. You can’t go wrong with any of the Series 7, as their enormous popularity has come from being solid, well-functioning, feature-packed shavers. While there are so many different Series 7 models out there, hopefully, this guide has taught you the critical differences between them, so you’re able to get the right shaver for your needs.